BALTIMORE, Md. 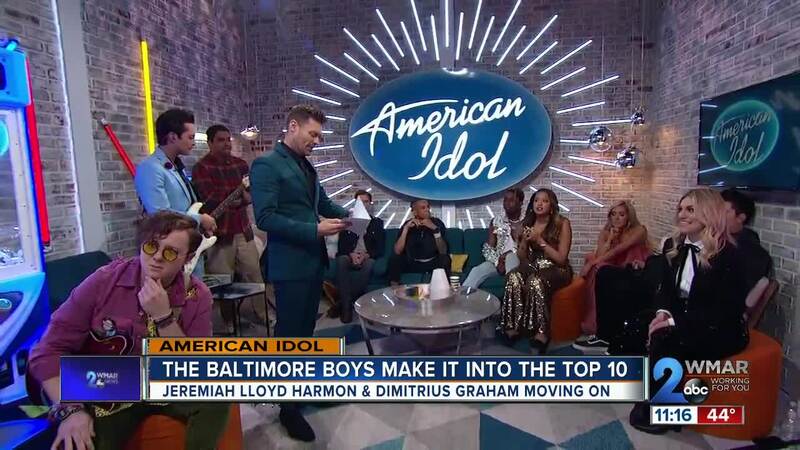 — American Idol has its 'Top 10,' and two of them are from the Baltimore area. It went pretty smoothly for church janitor turned Idol star Jeremiah Lloyd Harmon. But for Windsor Mill-native Dimitrius Graham, he had to fight his way out of the danger zone. Graham's rendition of the song "When The Party's Over" by Billie Eilish swooped the hearts of many and luckily grabbed Idol judge Luke Bryan's attention to make a save. WMAR-2 News' Abby Isaacs sat with Dimitrius' family during the anxiety-filled show. His mom was confident that he would make it, and when her dreams for her son came true, she couldn't hold back her tears of joy. "I'm excited, but I knew this was not the end of his journey. I knew God was not finished with his journey, so I am excited and I am praying, praying and believing that everyone is praying with me. He is gonna make it. He is going all the way," said mom Lorraine Ricks. Now, Baltimore can finally rave about its takeover in the competition! You can catch the two local stars on the American Idol LIVE shows at 8 p.m. on Sunday.